Just one member of the Bank of England’s rate-setting committee voted to raise interest rates from their record low of 0.5%, confounding City expectations that Threadneedle Street would use “Super Thursday” to send a strong signal that the era of ultra-low borrowing costs is coming to an end. With the Bank downgrading its near-term forecasts for inflation, after a renewed drop in global oil prices, Ian McCafferty, formerly chief economist at the business group the CBI, became the only policymaker to throw his weight behind a rate rise. Speculation among City experts had been that up to three MPC members could back tighter policy. “The near-term outlook for inflation is muted. The falls in energy prices of the past few months will continue to bear down on inflation at least until the middle of next year,” the MPC said in the minutes of its rate-setting meeting. The Bank now expects inflation to remain at around zero for at least the next two months, before rising to its 2% target at the end of the monetary policy committee’s two-year forecast period, if interest rates are increased in line with market expectations. That would imply the first rate rise coming in mid-2016, with borrowing costs climbing to 1.5% by the end of 2017. Sterling fell almost three-quarters of a cent after the announcement, to 1.5488 against the dollar, as prospects of an imminent rate rise appeared to have receded. The governor suggested in a recent speech that the decision to raise rates could come “around the turn of the year”. However, the Bank warned that with the cost of funding for lenders now starting to rise, mortgage rates could still increase in the coming months, even while the MPC opts to keep rates on hold. “Banks’ funding costs, an important influence on mortgage rates, had risen since May and it was possible that mortgage rates would shortly begin to rise,” the minutes said. Analysts had given the name “Super Thursday” to the simultaneous release of the result of the MPC’s monthly policy meeting; the publication of the minutes; and the Bank’s quarterly inflation report, all on the same day as Governor Mark Carney’s regular press briefing. Economic growth is expected to be slightly stronger than previously thought, at 0.7% in the third quarter, and 2.6% for this year as a whole, against a 2.5% forecast in May, as cheap energy costs and rising wages support consumer demand. The MPC also appears to have become more confident about the outlook for productivity, which has been a bugbear of Britain’s post-crisis recovery. “Private domestic demand growth in the United Kingdom is expected to remain robust. Household spending has been supported by the boost to real incomes from lower food and energy prices. Wage growth has picked up as the labour market has tightened and productivity has strengthened,” the MPC said. Nevertheless, a series of factors, including a slowdown in the labour market, persuaded eight of its nine members to stay their hand. 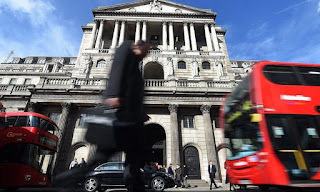 McCafferty was joined by fellow external MPC member Martin Weale in voting for a rate rise throughout the second half of 2014, but McCafferty was a lone voice. Samuel Tombs, senior UK Economist at Capital Economics, said a rate hike this year now looks unlikely, although it could not be ruled out entirely. “Contrary to widespread expectations of a 7-2 split, only Ian McCafferty broke ranks and voted for a rate rise. And the committee revised down its forecast for CPI inflation over the next 12 months and still expects it to only just return to the 2% target at the two-year policy horizon. In the Inflation Report, the Bank suggested that the rapid growth in jobs – which was one of the proudest boasts of Chancellor George Osborne during the recent general election campaign – appears to be petering out. “The pace at which unemployment can fall further is likely to be somewhat slower than in the past few years and Bank staff expect unemployment to change little in the next few months,” the report said. The health of the labour market, where wage growth has picked up in recent months, while hiring appears to have slowed, is the key uncertainty underlying the Bank’s projections, which the MPC stressed are “an expectation, not a promise”. Policymakers also made clear that they will be monitoring the health of the global economy closely. Interest rates have now remained at 0.5% for more than six years, after being slashed at the height of the global financial crisis, as the Bank sought to contain the recession. The MPC also carried out quantitative easing, creating £375bn of money to pour into government bond markets to underpin confidence and boost asset prices. Inflation was zero in June, triggering an explanatory letter from Carney to Osborne, published alongside Thursday’s other releases, giving the reasons inflation has remained so far off the government’s target of 2%. “The most important single reason for below-target annual inflation is the sharp drop in energy prices during the second half of last year,” the governor said in his letter.